When it comes to Email Marketing, MailChimp is King. You will not find one piece of content, be it an article or a video, about Email Marketing Software that doesn’t mention MailChimp and most of them would hail as being the top email marketing tool. However, just because something works for most people, it doesn’t necessarily mean it’s your best option. There’s no shortage of MailChimp competitors, so why don’t we take the time to check out some of those to see if there’s one that works better for you than MailChimp. Constant Contact is the most popular MailChimp alternative. It’s a great e-mail marketing platform for small businesses and a great marketing automation platform. The solution includes capabilities such as a drag-n-drop editor, social-media integration, real-time reporting, and more. Pricing is based on how many contacts you email and is quite flexible. Prices start at $20/mo for up to 500 contacts. You can also pay for a year in advance and get a $17 discount. One of Constant Contact’s best features is their educational resources. These include live webinars, on-demand webinars, live classes, day-long courses, and others – all to help small businesses learn how to not only use the software for the best results but to also learn more about email marketing. If deliverability rates are a concern for you, then Constant Contact should be on the top of your list. One of the main reasons that make this an excellent solution to handle your email marketing campaigns is the high deliverability rate. Most sources report a +93% deliverability rate, which is a considerable advantage over other solutions on this list. Cons: Constant contact doesn’t offer split testing, so you can’t test your marketing campaigns, which is unfortunate. Constant Contact is also on the expensive side. With a pricing model of 89$/mo, Emma is a modern email marketing system that has many features which make it ideal for some small businesses. With over 200 beautifully designed templates, you can create genuinely gorgeous emails that stand out from all other marketing emails out there. Emma’s reporting features are also quite amazing. They make it very easy to pull out actionable data from the reports while being easy to read and understand. Another great feature is Emma’s ability to put lightbox forms on your website ( lightbox forms are the forms that pop up while you’re on a site to ask for your email). Emma’s email automation and dynamic content abilities were designed to make it easy for beginners, and it shows. Cons: Those beautiful custom email templates are extra, so they cost more if you want them. Are you on a tight budget? Maybe you are looking for a free email marketing solution or a solution that offers the most features without having a hefty price tag? Then Mailerlite is probably the email marketing solution for you! If you pay annually, it costs only $6.66 to send unlimited emails to 5,000 subscribers. You can also pay nothing and still send endless emails to 1,000 subscribers. That's the most generous free plan you can find. The low cost of Mailerlite makes it perfect for beginner email marketers. It is also very lightweight and focuses on making emails easy to create and easy to send. This ease of use is reinforced by their drag-and-drop editor and built-in photo editor. The app also has A/B testing, the ability to embed sign-up forms on the website, basic autoresponse capabilities, and their iPad sign-up app. Cons: As mentioned, Mailerlite is exceptionally lightweight, and as you get more experienced, you will need something that offers more. Another great MailChimp alternative if you’re on a tight budget. Mad Mimi’s free plan gives you storage for up to 100 subscribers, and their $10/month plan gives you up to 500 contacts. Mad Mimi’s strongest point is probably their excellent customer support. Their representatives are friendly, patient, and helpful. You can customize and modify all emails without any HTML knowledge, and it’s quite simple. 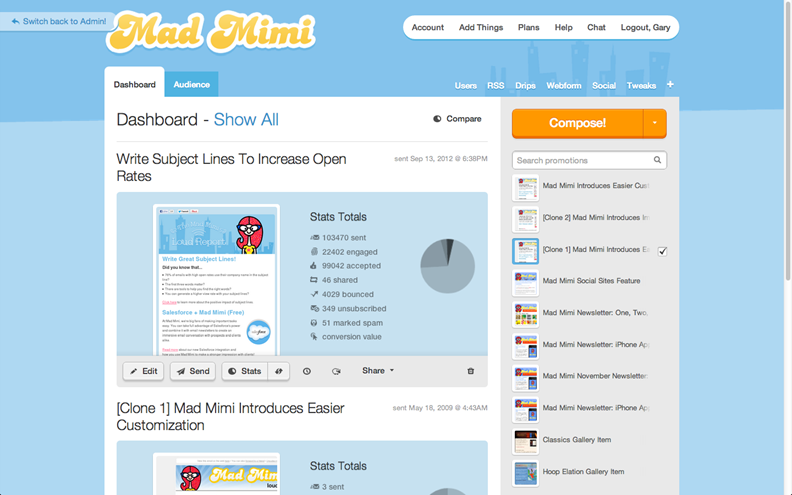 Using Mad Mimi is very simple, which makes it a good choice for beginner email marketers. Cons: Mad Mimi doesn’t have any email templates, and they don’t lack some essential features which competitors have – such as split testing. AWeber is an email marketing software designed with small businesses in mind. Especially, small companies that don’t have much time to spend on email marketing. Their pricing plans start at $19/mo, and for this, you get up to 500 contacts. One of AWeber’s strongest points is their templates; they have over 700 email templates. With such huge templates library, it’s doubtful you will need to do any customization. The solution also makes creating email newsletters a breeze. Another significant advantage of AWeber is that the solution offers up to 4 split tests at a time. Cons: AWeber’s import capability is not up to the level of competitors and can be a bit annoying at times. Contact is an email marketing solution that is created for businesses with a small email database size. Their most expensive pricing plan offers up to 15,000 contacts only. Those pricing plans start at $14 a month, for which you get up to 500 contacts. You can also pay annually and save 15%. iContact’s most significant advantage is their ease of use. It was designed to be used easily by anyone – even if they do not know about email marketing. In this spirit, iContact also offers a large amount of simplified learning material that includes comprehensive but easy-to-understand articles and webinars, live and recorded. Another pro is that they offer s free trial, so you can test the waters before committing to the solution. Cons: iContact’s interface is not that easy to use, which contradicts their simplicity and ease-of-use philosophy. However, some users do find it simple enough, but the majority would agree that it could be better streamlined. If you’re looking for the best bang-for-the-buck, then Campayn should take one of the top spots on your list. Their plans start at just $10 a month, and for this, you get up to 1,000 subscribers – pretty generous compared to what other solutions offer. Their pay-as-you-go plans are also quite generous, and they start at $50 for up t0 5,000 subscribers. They also have a “freemium” plan which offers 20,000 emails to 500 subscribers. Campayn’s best advantage over its competitors is that it can embed sign-up forms right on your website so you can quickly collect emails from visitors. Customers also report that their customer support is on a whole other level and that they could handle serious issues comfortably and minimize the effect they could’ve had. Cons: It can be tricky t import contacts, but if you ever face such a problem, you will find the customer support team more than ready to help you get through. 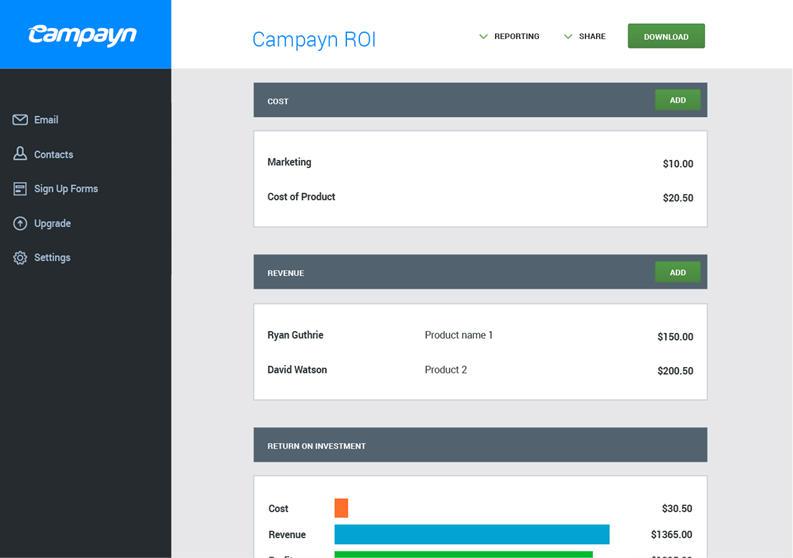 Campayn is also more on the pricey side, and their plans are only good for one user. You can add more users, but to do so, you must purchase multi-user accounts which start $39 a month for 15 people. If you are looking at the pricing plans of email marketing software and don’t find a plan that quite suits your needs, then SendInBlue is probably for you. SendInBlue is famous for their very flexible pricing as they have eight pricing plans. One of those eight is a free plan that lets you send up to 9,000 emails per month. Their paid plans start at $7.37 a month and allow you to send a large number of emails (40,000 emails, to be exact, at the time). SendInBlue doesn’t have a limit on contacts, no matter what plan you go for. SendInBlue’s works for pretty much any business size thanks to their super flexible pricing plans. SendInBlue also makes uploading contacts super easy. Cons: While SendInBlue allows for embedding social media sharing buttons in the emails, it is not simple to do so. The solution is also not well known, which is a pro for some but a con for others – so it depends on how you see it. A Feature-rich email marketing solution that starts at $15 a month, GetResponse is a serious competitor for MailChimp due to it being lower in cost. The Solution works best for small to mid-sized businesses, but large companies can make it work as well. Although its price is a strong point, the richness in features is what makes GetResponse a great email marketing solution. You get a ton of features and abilities. For example, you get a landing page creator, a tool to create marketing tracks for webinars, the ability to create five split tests, a drag-and-drop editor, and much more. Cons: Some customers complain about the customer service is not as responsive as it should be and as it is with other email marketing solutions. List Management is also not as easy as it could be. Are you an experienced email marketer who is searching for email marketing software with automation functions to make your life easier? FreshMail is definitely worth your consideration. It combines email marketing and marketing automation beautifully, but its main focus is on the automation side rather than the marketing side. Another reason FreshMail is worth your consideration is its competitive pricing. Pricing plans start at just $14 a month for which you get 1,000 subscribers. Their pricing scheme is flexible, and they have a pay-as-you-go option that starts from $7 for 1,000 emails. FreshMail also offers a freemium plan that gives you unlimited emails to 500 contacts. And it doesn’t stop there, FreshMail also does A/B testing. You can also create barcodes and send them out in emails, a convenient feature for retailers that want to send discounts in emails. Omnisend is an e-commerce marketing automation tool. Email marketing can be a limitation for expanding businesses, so if you're searching for MailChimp alternatives, Omnisend—with Facebook Custom Audiences, Google Customer Match Sync, automation, segmentation, popups and SMS automation—can be your first option. Ominsend can replace all the small plugins you're using, and you can have everything in one tool: different signup forms, landing pages, predefined marketing automation workflows, advanced visitors segmentation, and even SMS marketing. Cons: you can create advanced behavioral-based automation workflows, but you cannot copy them. Marketing 360 is not only an email marketing solution, but it’s instead an all-in-one marketing platform designed to help entrepreneurs, small businesses, e-commerce stores, and enterprises increase their sales and grow their brand. The solution is robust and intelligent as it combines digital marketing software, professional marketing services, and website designers to provide online businesses with an integrated platform from which they can effortlessly manage their campaigns and improve them. Marketing 360 can help businesses increase their visibility rankings on search engines, identify and understand the social profiles of their prospects, drive brand awareness, build their reputation online, and manage tasks associated with their customers, opportunities, and leads. The solution has easily-customizable websites that can convert visitors and generate sales with ease. Cons: Without initial guidance, using the solution can be a bit overwhelming at the beginning, especially for users with not much experience using similar solutions. Navigation could also use some improvements to become a tad more comfortable to use. ConvertKit is an email marketing automation and lead generation platform that’s designed specifically for professional creators; Course Creators, bloggers, YouTubers, and any businesses that create and share content online. The cloud-based solution doesn’t only make automating sending emails to their clients easier, but it offers a wide range of features to help them increase their subscriber list. The solution provides useful features such as the simple drag-and-drop email sequences, custom opt-in forms, workflow automation rules, landing page templates, and more. ConvertKit also allows users to create responsive opt-in forms and embed them on their websites. These forms will automatically adjust to where they are added, and there's no limit on the number of forms you can have, with each of them offering a different incentive for signing up. ConvertKit offers three landing page templates that can be easily customized with texts, textures, patterns, and even colors – all without needing to use any coding. One unique feature that ConvertKit offers is their plain text emails, which is, when you think about it, nice addition and a refreshing change for those of us wanting a break from our visual-heavy world. Cons: The solution could be a bit easier to learn and use, and it has, to a degree, a steep learning curve. They do, however, offer consultation and training. The limited A/B testing functionality and the limited reporting data could also be annoying to more professional marketers who like to dive deep into analytics. Simply Cast is an all-in-one marketing automation solution that helps businesses and marketers by making building targeted campaigns easier and quicker. The automation communication-flows will save your business precious time and make your campaigns more effective as well. SimplyCast focuses more on building stronger relationships with customers and turning them into loyal customers by reaching them on an individual level with personalized messages that speak to them individually and appeal their specific needs. SimplyCast also offers 360 Marketing Automation that’s able to track and record every action a lead takes, which allows marketers to connect more with customers and on a deeper, more personal level as well. You need to be ready to invest some time to be able to make use of all the features you are paying for, and you will want to do that since you are not going to be paying little for it. The solution is also a bit difficult to use and is aimed at more experienced users. SharpSpring is a powerful email marketing platform that’s designed to easily integrate with any system or third-party apps you are already using. The solution is created mainly for small and midsized businesses and offers a wide range of features to help them get all the online marketing functionalities they need from one place. Since it’s aimed at small businesses, the solution offers one of the best bang-of-the-buck experiences, as you get a lot of features for quite a low price, and you also get free unlimited support and open API integration. There are also no annual contracts, and users can be free signing up month to month and opting-out whenever they feel like it. SharpSpring enables users to manage, brand, and charge customers however they want, and anyone in the organization can use the solution. SharpSpring can also track incoming sales and prospects, and offers CRM email functionalities to connect with customers. It also stores all key sales and marketing materials in a single location so that it can accelerate your workflows as well. Cons: Payments with currencies other than the US dollar can be troublesome (some customers in the UK reported they pay the same Euros as US dollars, even though they should pay less considering the difference in currency exchange rates). The landing page builder also lacks some intuitive features. I hope you now have an idea of what those email marketing solutions offer and how do they differ from MailChimp and each other. Also, hope you have found what you were looking for. If you found this article helpful, Share it with friends! If you have questions, leave them below, and we’ll get back to you. I remember MailChimp for having good statistics and great API for scripting purposes. The HTML editor behaved a bit strange. Better than VerticalResponse, but not great.